Square Enix and Avalanche Studios have announced that the first of Just Cause 4’s three DLC packs, Dare Devils of Destruction, will launch on April 30, 2019. However, those who purchased the Gold Edition can access the DLC one week early on April 23rd. Dare Devils of Destruction will allow players to fully explore their inner wild side, with a whole host of new missions, modes, and weaponized vehicles. Master the art of destruction and create carnage within this explosive arena. Reduce targets and rival drivers to scrap metal to achieve the high score! 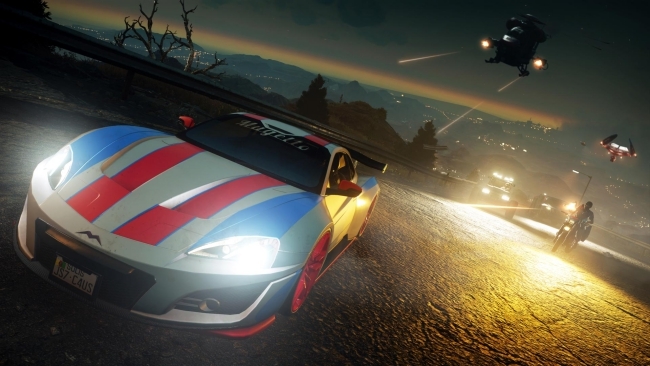 Drive through extreme weather and master high-speed stunts in Run. Obliterate your rivals with a variety of weapons as you try to cross the finish line! Speed through a gauntlet of landmines, wrecking balls and rings of fire in this ultimate drive for survival. Destroy obstacles along the way and race towards the checkpoints to secure victory. The remaining two DLC packs for Just Cause 4, each of which has a theme of “Demons” and “Danger,” respectively, still lack release dates. In the second DLC pack, “Demons,” Rico will have to combat demonic forces that mean to invade Solís. Rico’s former employer will also infiltrate Solís in the third and final DLC pack, “Danger,” bringing with them highly skilled operatives, and advanced weapons and technology systems. Just Cause 4 is available now on PlayStation 4, PC, and Xbox One platforms.